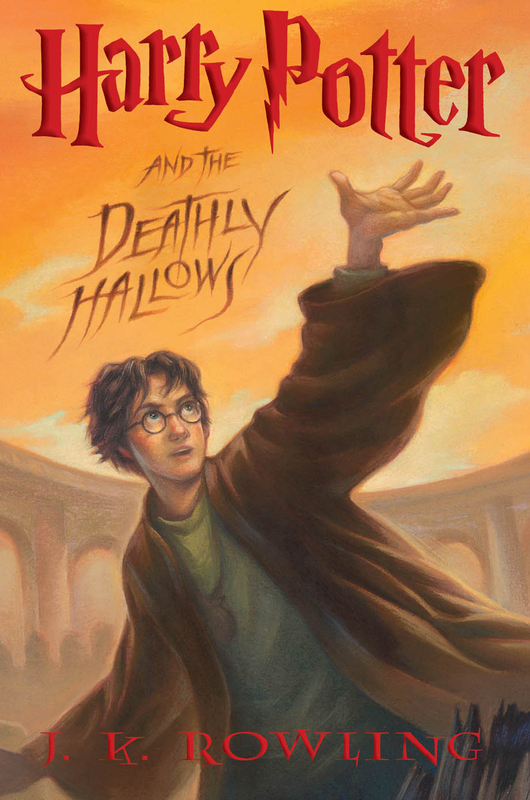 It took me fall, winter, and spring, but I finished my third venture through the Harry Potter series. And you know what? I enjoyed it as much as the first time. I’m amazed at the imagination and intricacy of the books, and I’m doubly amazed at how much I forget in a few years’ time. In Harry Potter and the Deathly Hallows, though he remains veiled and therefore more frightening to the public, Voldemort has nearly completed his takeover of the wizarding world. The Ministry of Magic has capitulated and is now run by Death Eaters whose policies are reminiscent of the Nazi regime. Pureblood families are given high status, those of mixed Muggle/wizard blood are tolerated, and Muggle-born wizards are persecuted and sometimes killed. Muggles are simply animals to be hunted. Pockets of resistance, however, are widespread. As soon as Harry learns of the Ministry’s fall, just before the start of his seventh and final year at Hogwarts which he knows he must miss, he sets out on the quest Dumbledore set him: find Voldemort’s horcruxes and destroy them. A horcrux is an object that contains a fractured part of a soul. Even if Voldemort dies, he can rise again as long as he has a horcrux tying him to life. He’s like a cat with nine lives. To ensure his final destruction, Harry, Ron, and Hermione must find and destroy the remaining horcruxes. But where are they? Because this final book is a quest, it feels a little less structured than the others, but I never once felt it lagged. Each time the heroes reach the point of despair, they are given help or make a breakthrough. Little by little, the story builds to the final confrontation that simply must take place at Hogwarts, the place it all began. Many excellent characters meet their demise in this book, especially in the last hundred pages. Loyalties are determined once and for all, and a good many surprises lie in wait. Though we know, of course, that Harry must win, it only happens at the highest cost and through the most twisting of circumstances. Dumbledore’s theories and manipulation lie at the heart of the conclusion, and explanations are given that reach back all the way to the very first book. It is a nicely packaged, thoughtful conclusion to the series. I especially enjoyed the final epilogue that takes place nineteen years later. I maintain my 12+ rating. This one is tragically bloody. It contains sweeping, epic scenes of violence during the final battle. It also includes the torture and screams of Hermione when she is captured by Death Eaters and the strangling death of another. Nagini the snake emerges through the neck of an inferi (dead person who does Voldemort’s bidding) in a particularly nasty scene. One of the influential characters orders his own death by another, which is supposed to be sacrificial in nature but actually smacks loudly of euthanasia (“…avoid pain and humiliation…” “…I should prefer a quick, painless exit to the protracted and messy affair…”). Yet the main themes of this book are overwhelmingly positive: loyalty, friendship, selflessness, sacrifice, and courage. It celebrates standing for principal, standing for ultimate truth in the face of dire consequences. Death, it is maintained, is not something not to be feared, and love conquerors even the greatest of evils. Like The Lion, the Witch and the Wardrobe, there can be found within the pages of Harry Potter a story of salvation, of redemption, of old, deep magic beyond the understanding of man or wizard. It is the echo of an older, greater story. It is a story worth reading, worth celebrating. In my final conclusion, the evil within Harry Potter is the stuff of nightmares, but Hogwarts is the stuff of dreams. The detail, imagination and adventure are, quite simply, magic. While Harry should be read at an age that can handle dark spiritual themes, in my opinion, it should be read! They are very well-known to the veteran reading crowd, but don’t forget there are lots of kids coming up every year who haven’t read them yet! And I’m betting there are lots of parents who can use the reminder to help them decide when their own kids are ready to read them. I suppose you are correct! Parents often wonder if the books are okay for children to read. Perhaps I’ll think again and review the books. Many parents have probably read them, but if it’s been awhile, it’s easy to forget content. I am a huge fan of HP and I think the books are so well-written. I listen to Jim Dale read me some part of the series every night as I fall asleep. The 7th book was bittersweet for me. I waited for it for so long, but then I was sad that my adventures with Harry were over. I loved the epilogue and I enjoy the books every time I read them! Great review! I know exactly what you mean. It’s almost a sense of loss when you reach the end. The good news is you can start all over again! I have been waiting for your review! Excellent. You summed the book up in a very thoughtful manner. I loved the last two books, and enjoyed trying to figure out where the horcruxes were. The ending was beyond what I imagined, and I loved Rowling’s ability to keep the suspense until the end. I was sad to see the book series end. A let down — but then the movies came out. The books are far better. Thank you, Pat, for those compliments. I agree, the books are far better than the movies, but I did enjoy watching each one after reading through the series this time. I hadn’t seen them before. It was kind of fun to see the kids growing up right before my eyes.